1849 Tubular Bridge with wheels on circular track under the A370 Plimsoll Bridge. 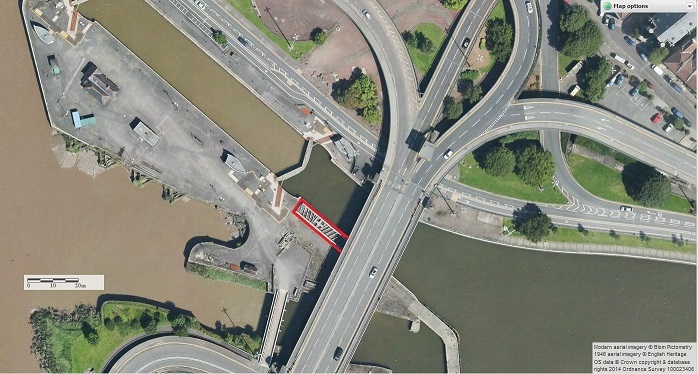 Map showing it crossing the lock! 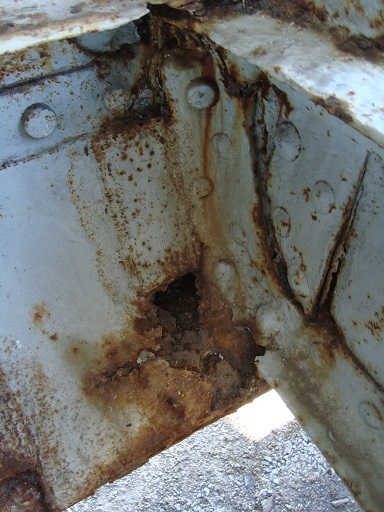 Investigative repairs to save the bridge were successfully done in January 2015 on the base of the beam. We need help to complete the project and stop the rot before it is too late. The latest estimated total costs of restoring the bridge and putting it back into commission is £695,000 and would take 9 months. We are very greatful for the support given through the years by Historic England by funding the investigative work. 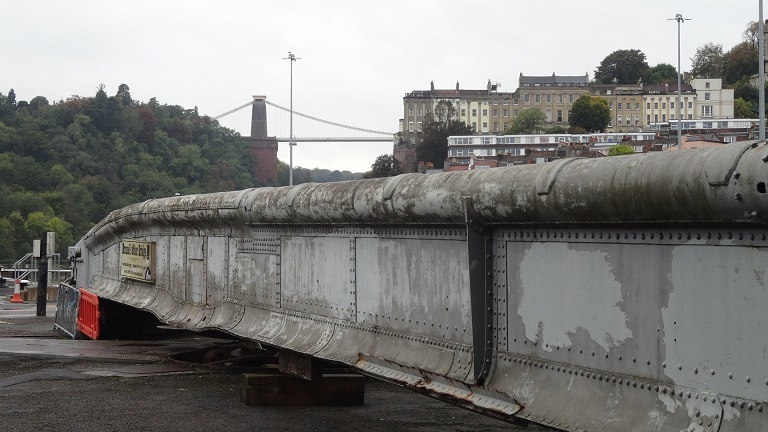 They are very keen to get this important grade II* Brunel bridge off the at risk register. As the treasurer of the BOB project, the AIBT would like to thank the Bristol Visual and Environmental Group for a donation of £10 000 in 2018 in memory of Dorothy Brown (we had already received £4 000 in 2017). Dorothy was for many years an indefatigable champion of the heritage in Bristol and its environs. Many historic buildings owe their continuing existence to the battles she fought for the heritage up to her death in 2013. Please note that the donation link is now: https://mydonate.bt.com/charities/brunelsswivelbridge . The SWIVEL BRIDGE is Brunel's first large wrought iron opening bridge, it is far older than the Suspension Bridge, and is Bristol's only abandoned Brunel structure. The Bridge is listed Grade 2* and is on English Heritage's Buildings at Risk Register. The bridge rotates on four fixed wheels in contact with a solid ring under the bridge. 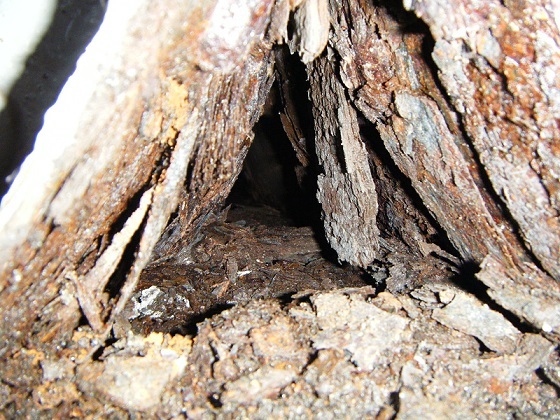 The bridge was turned by a hydraulic mechanism of twin rams located in pits that are connected to a turning ring under the bridge via a substantial wire cable. The original turning mechanism prior to conversion to hydraulic machinery was a hand turned crank similar to that used on old train turntables. The pistons and chains are still in position. The original hydraulic system ran on fresh water supplied from a pressurised water system sited in Underfall Yard. The bridge was designed in 1849 by staff in I.K. 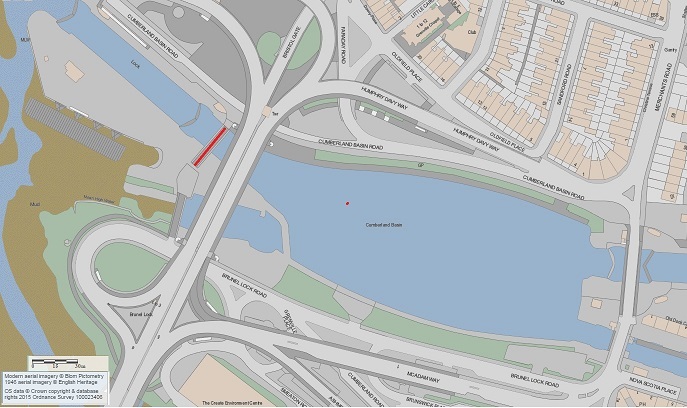 Brunel's Westminster office to carry traffic over the new South Entrance Lock ('Brunel's Lock') in the Cumberland Basin, which was under construction at the time. The bridge became operational in October 1849. Brunel himself was closely involved in both its design and its construction. Represents an early stage in the development of the flanged plate girders that characterised Brunel's later medium span wrought-iron bridges. Brunel’s Swivel Bridge, which spanned the new lock, was fabricated at the Great Western Steamship works where the SS Great Britain had been built a few years earlier, and where the ship is now displayed in splendour. 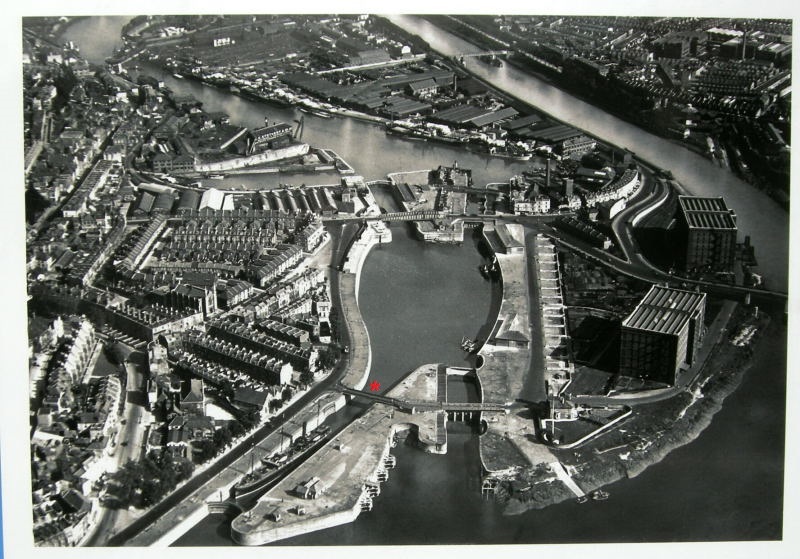 In 1872-1873 the bridge was shortened and relocated to its present position over the North Entrance Lock ('Howard's Lock'). The hydraulic machinery of the lock was renewed in 1901-1902, manufactured by Sir W.G. Armstrong, Whitworth and Co Ltd of Newcastle upon Tyne. The bridge was decommissioned in 1968 after construction of the nearby Plimsoll Bridge as part of the new Cumberland Basin road system and it narrowly avoided being scrapped when the new bridge was constructed. weighs approximately 68 tonnes without the timber deck. It is located on the man-made island at Howard’s Lock in the Cumberland Basin and rests in the open, swung position parallel to the dockside. The nose locates underneath the Plimsoll Bridge and when the Plimsoll Bridge swings open the clearance between the two bridges is as little as 4" over the starboard side girder. This clearance is currently 8" since jacking up the tail end. This project has been supported by CHIS for many years. We now have BIAS, AIBT and the Hotwells and Cliftonwood Society to help as well and do some dirty work. The initial refurbishment project is being led by Geoff Wallis of Dorothea Restorations (gwconservation@gmail.com). 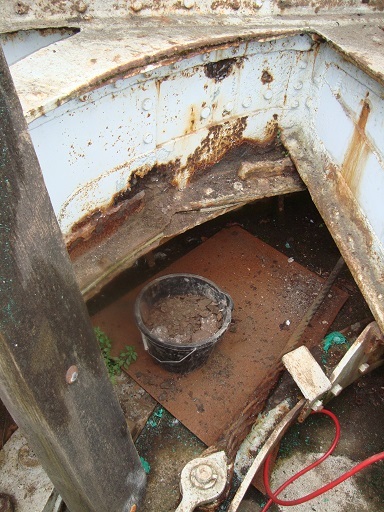 Investigations being carried out by contractors and volunteers into the rotation of the bridge This wil be paid for by grants from Historic England. This will be an exciting year in which we hope to have the Bridge turning again, 170 years after it was comnpleted to Brunel's innovative design. We plan to work on Saturdays, but there will be extra work-days as necessary to achieve our aim of trial turning this year. We must complete the levelling of the wheels, purchase and install a new steel-ring track, centralize and lower the whole deck-assembly, and strengthen the corroded structure, so plenty of helpers will be needed and all skills welcome, not only engineering! Contact Geoff Wallis (jandgwallis@gmail.com)so we have an idea of numbers. Progress for each year can be seen using the navigation tabs of Project.